Spring or winter: Winter red wheat tends to hava slightly higher protein and is a bit harder than content than spring. Winter red is better for baking bread. There is not a significant difference in hard or soft white wheat. Hard or soft: Hard wheat varieties have higher gluten (protein) and are better for making breads. Soft varieties have lower protein and nutrients and are better for pastries, pastas, and breakfast cereals. Red or white: Red wheats tend have a stronger wheat flavor than white wheats. Most red wheat varieties are hard, and most white wheat varieties are soft, but you can find soft red and hard white if you really prefer one over the other. If unopened, the optimum shelf life of wheat is 12 years or more. It is edible for a lot longer than that, but won’t necessarily keep the same flavor or nutrient levels. If opened, wheat will stay good for about 3 years. Once it is ground into flour, wheat loses most of its nutrients within a few days unless you store it in the freezer. You can add oxygen absorbers, bay leaves, or dry ice to help keep critters out of your wheat. A lot of people are intimidated by grinding wheat, or wonder how you grind wheat. 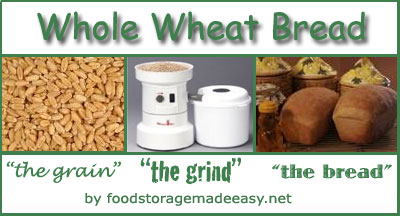 It’s actually really simple and wheat grinders are available in a wide range of prices. The main thing you need to decide is if you are planning to use your wheat stores on a regular basis and rotate through them, or if you only want to use your wheat in an emergency situation. If you plan to use your wheat frequently it is worth investing in a quality electric grinder. We recommend the Wondermill Grain Mill as it seems to be the fastest, cleanest, most convenient of electric grinders and only $239! (In fact, we liked this mill so much that we decided to apply to become an official dealer for them … more on that next week though!) For emergency-only usage, a hand grinder will be sufficient, but make sure that you get one that can still grind into a flour fine enough for bread. The Back to Basics grinder is the cheapest one we found that would still grind flour. For a simple demonstration on how you actually grind wheat, please view our How to Use a Wheat Grinder video on YouTube. Combine the first 5 ingredients and mix. Add 5 cups flour, oats, and gluten flour. Mix well. Continue to add the other 1 c. flour slowly until the dough forms a ball and scrapes the excess dough off the sides of the bowl. Let mix for 5-10 minutes. While mixing, preheat your oven to 100-125 degrees. Oil the counter surface & your hands (Use oil, NOT flour). Put your dough on the oiled surface & slice WITH A KNIFE into 2 large or 3 small even loaves. Pat down and roll into loaf shape, then put into greased bread pan. Turn OFF your oven, cover loaves LOOSELY with saran wrap, and put in warmed oven to rise till double (about 45-60 minutes, depending on humidity in the air). Remove loaves from oven and preheat to 350 degrees. Bake loaves for 25-30 minutes. Remove from pans immediately and place on a wire cooling rack.